I was amused as I read of others making "traditional New Year's food." I wondered what in the world they were talking about. Maybe I've lived a sheltered life, having grown up in the Phoenix area-well except for great Mexican Food. 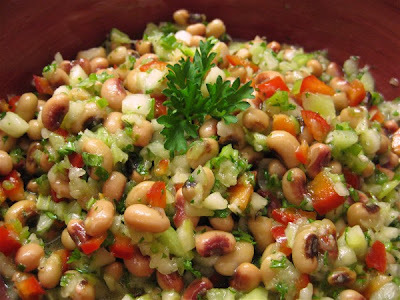 Honestly, I've never heard about the good luck black-eyed peas deliver if eaten the day of the year. 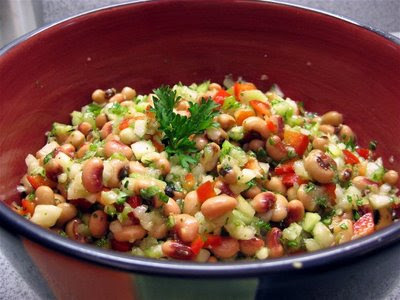 Truthfully, I'd never eaten a single black-eyed pea in my entire life. After seeing the Pioneer Woman's Black-Eyed Pea Dip, I thought I'd give it a try. Not sure why they are in the pea family they taste and look like beans. Split peas at least are green, so look like peas. Mix vinegar, spices & olive oil for dressing. Chop vegetables and add to drained peas. Mix all together and refrigerator an hour or so. Stir before serving. We ate this as a salad with Glazed MahiMahi & rice last night. It was delicious. The pioneer woman serves it with chips as a salsa. Must be the jalapeno pepper that makes one want to eat it with chips.